One of the strategic goals of the School of Education, Teaching & Health is to “bring the world to AU and AU to the world and act on values through social responsibilities and service.” This is a goal that we not only encourage our faculty and staff to exemplify but our students as well. While many students have ideas on how to bring this strategic goal into fruition, there are not always funds available to support the various ideas. This is where grants like the Eagle Endowment play a large role in helping our students become agents of change in the surrounding community. In 2014, Health Promotion Master’s candidate J.R. Denson received the Dr. Martin Luther King, Jr., Eagle Endowment award. This grant, in particular, is meant to be utilized by AU students or student organizations to promote social justice by "building partnerships, empowering communities, and serving to make a difference." He was awarded funds to implement a community learning garden for a year-round youth mentoring program which principally serves under-resourced families in DC public housing. 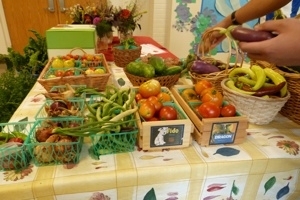 The children, ranging in age 5 - 12 years old, will have the opportunity to literally have a hand in seeing fruits and vegetables go from ground to table as they help to build the garden, cultivate the produce, and ultimately take part in cooking lessons to learn to make healthy meals for themselves. Dr. Elizabeth Cotter, a professor in the Health Promotion program with a particular interest in community gardening, stated that "Gardens can play an important role in the health of communities, not only by increasing access to fresh fruits and vegetables, but also by enhancing opportunities for communication and collaboration among community members, and providing an opportunity for youth to learn more about nature and where their food comes from.” Through this grant, Denson will play a part in providing healthy foods in areas where fruits and vegetables are so often inaccessible.